I spent the day cooking with mom yesterday. Once before, we had spent the day making my grandma's Cabbage Rolls together so that I could learn to make them myself since they are one of my husband's favorite dishes. For some reason, I did not write any directions on this particular day so I called my mom yesterday and asked her if I brought supplies, could we have a second go and I'd write the recipe down this time around. She of course said 'yes' so I showed up a bit later loaded down with the groceries that she had told me to buy. We spent the day cooking and I now know why I didn't have, and still don't have, a recipe written down. It's one of those recipes where everything is 'eyeballed' as far as amounts and once again, I left there with a vague notion of what to do but no clear instructions. So, next time, I will try to make them myself at home and write down a usable recipe, and then I'll learn to make them as well myself as my grandma made them and my mom now makes them. Regardless, it was a fun day and we capped it off with a scrumptious dinner followed by a night of Bezzerwizzer. I'm thinking maybe I'll have to have mom help me just one more time before I attempt these rolls on my own ~ it was much more fun making them with her and then spending the evening together! ﻿﻿﻿ On the knitting front, I'm working on Iceland by Kieran Foley. It's slow going since I am adding beads to mine but I'm loving the result. I'm not sure it will be large enough to wear as a shawl since the Ecobutterfly Organics Pakucho Lace Cotton I'm using is not going to block much bigger than it is right now, but if it doesn't, it will make a beautiful table runner during the wintertime. It looked lovely on my mom's teak dining table yesterday when I was showing her how it looks at the halfway mark. a gift from a friend ~ thanks, Kelli! Betsy Herschberg, Get Out of My Left-Brained Head! Yep, I'm pretty sure she's been poking around in there somehow and reading my thoughts. We were lucky to have Betsy speak at our monthly guild meeting last night. She makes these amazing, one of a kind, knitted and beaded jewelry pieces but what struck me about her was having someone put a voice to all my 'way too analytical to be creative' self-doubt. I related to every single 'I can't do this', 'I shouldn't be doing this', and 'I can't believe I'm doing this...and that people like what I'm doing' moment she shared with us. Great speaker. Very inspirational to me and at a critical point, I think, in my thought process. I've been having these internal debates with myself about how much satisfaction I get from recreating someone else's design to the letter. It used to be enough ~ that 'it's perfect' moment when I've followed a pattern down to the last bound off stitch ~ but I'm not getting that feeling to the same extent anymore. I think that I'm at a turning point where I need to focus my time and energy a little bit towards seeing what I can do that screams ~ 'Not only did I make this awesome thing, but I imagined it from the very beginning and it's all mine!!' Betsy did just that and found her voice and an outlet for a creativity that she didn't think she had in her. Thanks, Betsy for helping me to affirm that I can at least try to see what I can do. What harm can come of that? 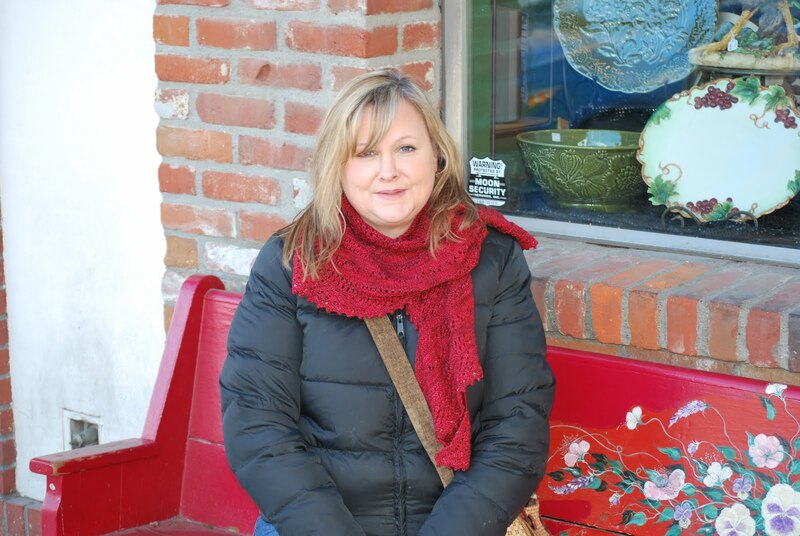 You can decide for yourself if she's creative or not on her website, Studio B Knits. Thanks so much, Tamra! My husband and I are looking forward to trying them all! On the left are Bella's Mittens, a free pattern that I made with Rowan Cocoon. These are a birthday gift for my sister. On the right are Brushed Suri Mitts from Blue Sky Alpaca that I made with BSA Brushed Suri in Lollipop, a hot pink yarn that matches the highlights in my brother's girlfriend's hair. They are her birthday gift and she's excited about them (I showed her the yarn before I started). 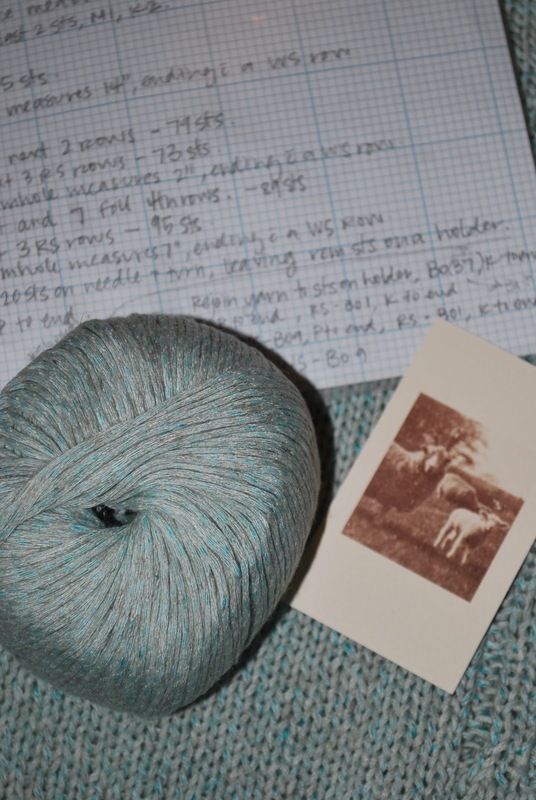 And I'll end the post with an update on Kelli and my top secret test knits that we did for Coralie Meslin this past summer. They are officially in print in two of Tahki Yarns recent Spring\Summer 2011 publications. Above: Kelli's knit showed up in City Tweed, Tweed Collection 5th Edition ~ it's called the Boerum Hill Top. I love this pattern! I would definitely wear this! Below: My knit showed up in Kaleidoscope Cotton Classic 5th Edition ~ it's called Aqua Velva 1-Shoulder Tank. A bit too daring for me but it looks smashing on the gorgeous model, don't you think?! 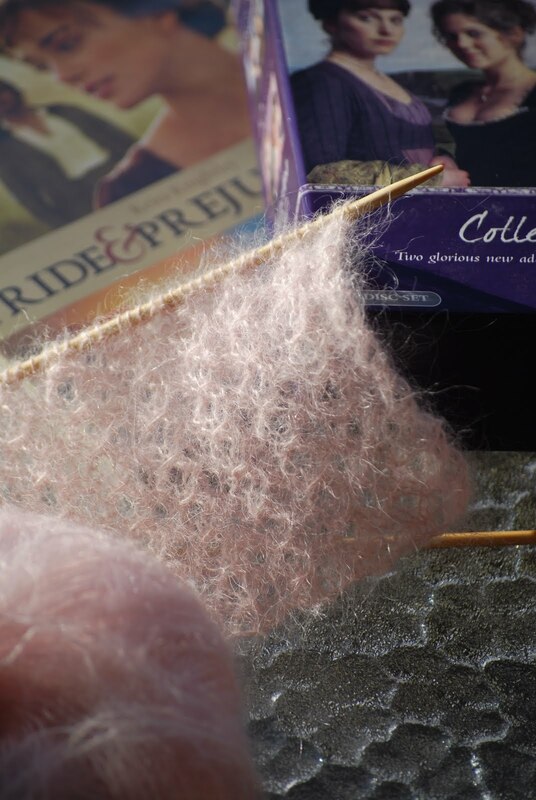 Thanks Coralie, for giving us the opportunity to knit up a couple of your new designs and getting the chance to see something that we had on our very own needles pop up in print. So cool!! Here we are wishing and dancing a happy valentines to you!!! So, on to more important things....the attic has 1/2 a floor and my wonderful handy man of a husband is working on finishing it today! Isn't it pretty? The window trim and baseboards will be bright white and will look great, I think, against the green paint. Last night my husband suggested that I get skylights installed to help with the lack of natural light....'um, ok?'. Did you think I'd say no!? How cool is that? That's definitely an expense for a later date but to know that I'll eventually get them is awesome ~ and there's an added bonus of there being a sweeping view of Puget Sound on the other side of that darn attic roof......I can't wait!!! Today I'm casting on a belated birthday gift for my brother's girlfriend ~ I'm making her these Brushed Suri Mitts with BSA Brushed Suri in Lollipop, a hot pink shade I know she'll love! He and I are huddling up around the kitchen table today to play a little poker. I'm hoping I win ~ tax time ~ blech! Decided to dress for the occasion so I'm wearing my new shawl for the first time. Thanks everybody for knitting along ~ it's a great way to start the year, knitting alongside friends. Here she is ~ man, it's hard getting a photo that does justice to all this work and tiny detail! I did check today and the pattern is still up and available for free download (at least for the moment!) so if you're inspired to take on this project, here's the link. 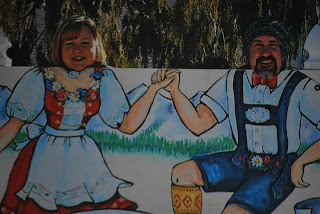 Way up in the Cascade Mountains in Washington sits a sweet little Bavarian style town called Leavenworth. My husband and I spent 4 days in quiet relaxing time. What's that you ask? 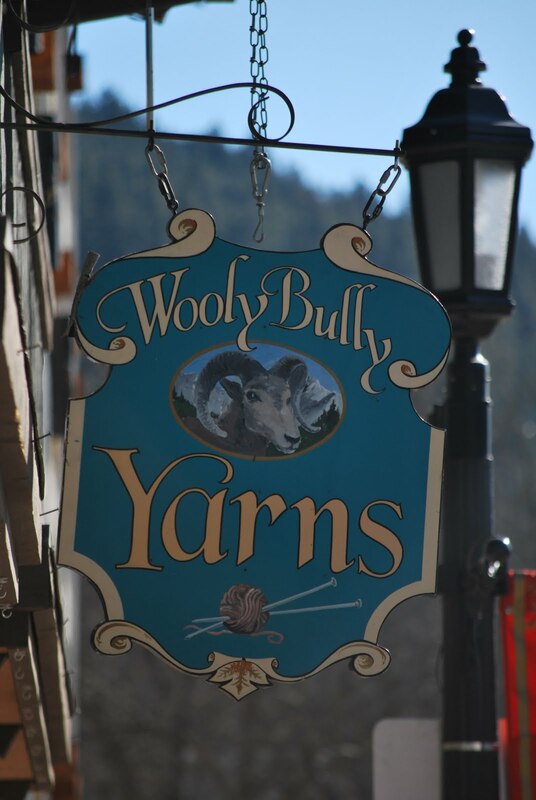 Yarn shops?~Oh yes. 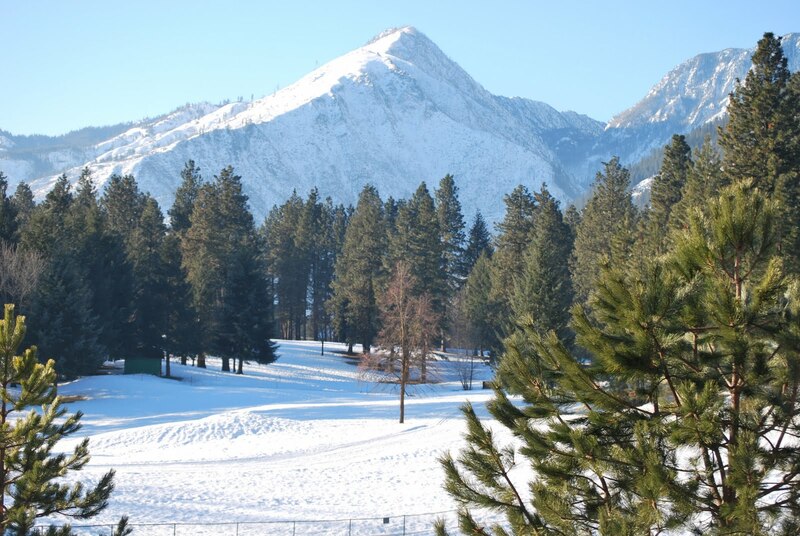 Leavenworth it self has a small one. Good yarns and a few beads. The cashier only looked up once as I purchased my hand-dyed Araucania,Ranco solid,olive shades wool, to agree I bought a beautiful yarn. So if looking for hositality don't shop there. 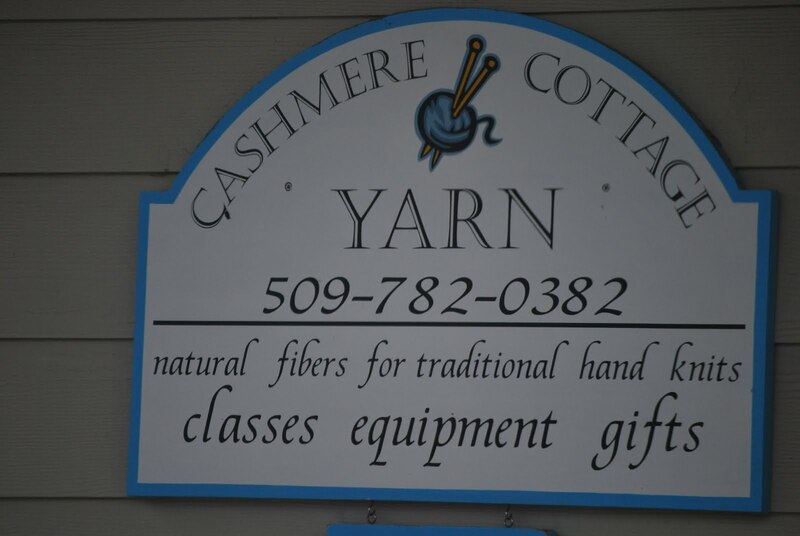 Cashmere Washington about 15 minutes away on the other hand has Cashmere Cottage! I was happily welcomed, and spent my time looking and chatting to Judith, the shop owner, while others came for her help, her grandaughter who didn't have preschool that day knitted and I think was wondering were's lunch? I purchased 2 hanks of Paca-Paints, #403 Mesa color,alpaca. Like I need more alpaca! She continued her kindness with a 10% discount!!! Highly recommend shopping/stopping by if you ever get a chance. My husband popped in the local sportsmen store to find out what the fish where biting on. He fished a little, I knitted. We'd watch Jane Austen movies along with whatever night time 'cop shows' were televised. Brought our favorite foods and enjoyed each others company. It was refreshing. I don't have many earth shattering recipes to share but since Snohomish Shepherdess inspires me daily with food from her kitchen, I thought I'd reciprocate and post one of my favorite recipes of all time, Mexican Soup. I've shared it with just about everyone I know and it's a staple at family functions when my family gets together since it's healthy, easy and a 'build your own' type of soup ~ everyone can choose their own ingredients at the table. Some of my husband's family used to winter in Baja California Sur in a house they built on the beach in a little place called Posada Concepcion on the Sea of Cortez, a few hours north of Loretto. We took our first vacation as a married couple in 1996 and went to visit ~ it was my first trip to Mexico and we were treated to kayaking in the bay outside their front door, golfing (well, my husband golfed and I walked the course which was a great way to spend a day! ), whale watching in Lopez Mateos, and a pig roast in Mulege. One of the meals we cooked for ourselves was Mexican Soup. We had the luxury of amazing farm fresh produce that periodically was sold from the back of an old pickup passing by. It's basically chicken soup, with all the fixings for tacos, and it is Delicious! I cooked a batch yesterday and we got the photo albums out after dinner and reminisced. So, since one of the things about our journey down south that has stuck with me over the years is this soup, I'd love to share it with whoever comes across this blog post. I used 4 quarts of chicken broth and boiled 5 lbs of bone-in skinned chicken thighs in the broth with a small handful of Mexican oregano until the meat was falling off the bone﻿. I removed all solids from the broth and set it aside to cool so I could skim the fat later on. When the chicken is cool enough to handle, debone and shred the meat. I actually froze 1/2 the broth and 1/2 the meat to make Chicken and Dumplings later on. For veggies for the soup, use whatever you like in a taco. We use lettuce, tomato, green onions, avocado, jalapeno, cilantro and lime. After washing everything well, shred the lettuce and cut the other veggies into bite size pieces (they will be flash cooked in the hot broth when you build your soup so you don't want the pieces too big!). I squeeze lime on the cut avocado to keep it from browning, and also put a squeeze in my bowl of soup before eating. Cook a pot of rice, enough for about 1/2 c cooked rice per person. I've tried just about every type of rice and my favorite for this soup is Basmati. I love the nutty flavor with the lime and cilantro. Last night we tried this organic brown basmati ~ I prefer the flavor of the white stuff but I know, I know, the brown is better for you, blah, blah, blah.... It was alright but not my favorite. Now the fun part ~ when you're ready to eat, start with a scoop of rice in the bottom of your bowl, followed by shredded chicken, and then your choice of the fresh uncooked veggies that you've prepared. Ladle hot broth over the top ~ the veggies cook just enough that they're warm but still crunchy. If you like it spicy, you can add a few dashes of your favorite hot sauce but I prefer mine with a squeeze (or two!) of lime, and served with Cheddar Cilantro Quesadillas and a Mexican beer. This is one of my favorite meals and I hope somebody that hasn't had it before gives it a try and loves it as much as I do.